The old timber headstocks were made of elm. 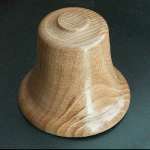 Large pieces of elm are quite rare in England now. Dutch Elm disease wiped out virtually all mature elm trees in Britain and Western Europe at the end of the 20th century. New trees grow, but before they attain a significant size, they too are killed. We felt it would be a shame to waste such a rare resource. Elm is a very good wood for carving and turning, so we cut up the headstocks and made turned wooden bell mementos from them. The large number of bolt holes, and a few cracks, limited the useful pieces of wood that we could extract, but in total, the eight headstocks provided enough wood for 92 model bells in three different sizes (5", 4" and 3" diameter). Each has a metal plaque on its base to identify the source of the wood. All of them were eagerly bought by ringers and congregation.